I normally don’t eat meat and consume chicken once in awhile along with few seafood items. I’m more of salad and fruit person and was happy to find several vegetable dishes from my latest cookbook addition, Food From Northern Laos. For lunch today, I made another Luang Prabang Salad (Watercress Salad) from the cookbook but since there was no watercress at the grocery store, I used Veldsla (don’t know what it’s called in English) for alternative along with mixed young lettuce. There was no mint either, which the recipe calls for but at least I bought the last bunch of coriander. 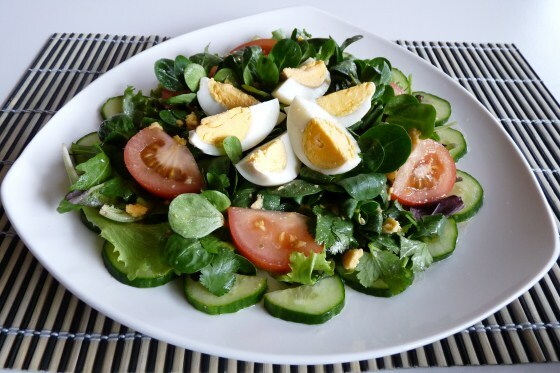 The beauty about this recipe is the fact that my salad is as delicious with using substitute ingredient or omitting one or two ingredients like mint and chopped peanuts. Since I am allergic to garlic I didn’t use it the last time I made the salad for dinner. But for lunch today, I added one tiny clove of garlic for the extra aroma and taste. Lao Salad using a recipe from Food From Northern Laos: The Boat Landing Cookbook. I boiled extra two eggs so I can add a few pieces on top of the salad for presentation. 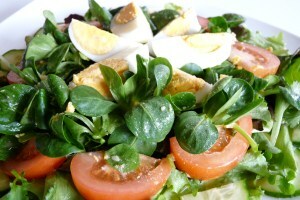 The salad is as delicious as the one served at a restaurant in Luang Prabang. But don’t take my word for it, try the recipe for yourself and you just might feel like you made a salad like it came straight from restaurant menu. That looks a lovely salad Darly, made me regret I already ate well tonight. I know veldsla of course, but don’t know the English word either. But that’s the joy of this style of cooking, you can replace any ingredient that is not available by using your own judgment and choosing a replacement that comes close. Of course, most recipes in the book are based on local village recipes, where the content of a meal would simply depend on what’s growing (or has been planted) nearby, and what’s in season….